Fresh basil, plum tomatoes and fresh buffalo mozzarella cheese. 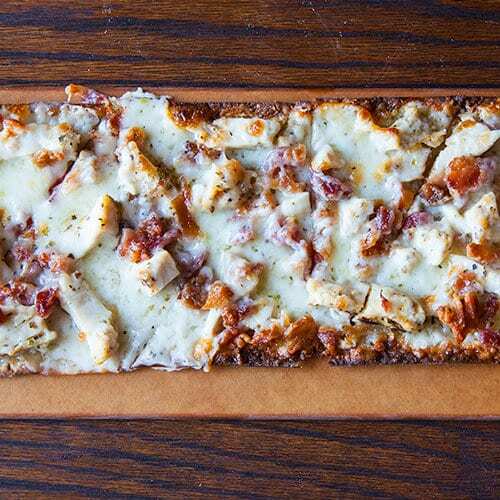 Grilled chicken, crisp bacon, mozzarella cheese and ranch dressing. An Italian take on the French original (fry that is). 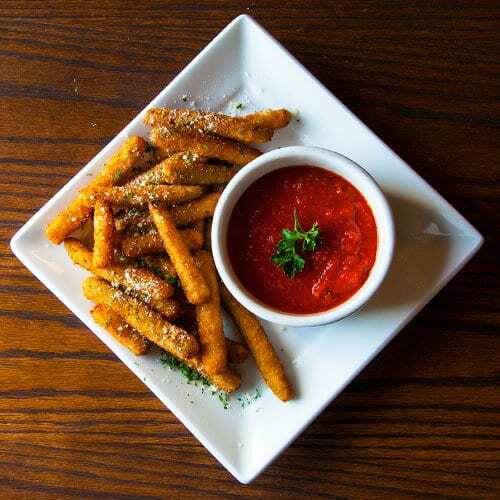 Tender slices of zucchini, lightly breaded and coated with Italian cheeses, flash fried, and served with a side of marinara sauce. A new take on an old classic: ricotta cheese raviolis, coated in Italian breadcrumbs and toasted until they're crispy on the outside, creamy on the inside. Our fresh baked bread topped with basil pesto & loaded with mozzarella cheese. The ultimate meatball experience: perfectly seasoned meatballs capture the essence of Little Italy. Served in tomato sauce and melted mozzarella cheese. An Al's favorite! Whole milk mozzarella cheese dredged in Italian breadcrumbs and fried to a crisp (then gooey) perfection. Served with marinara for dipping. Lightly dusted in breadcrumbs, fried to golden brown, topped with a spicy garlic sauce and served with a side of marinara. Toasted garlic bread served with a side of fresh diced Roma tomatoes, basil & garlic. Finished with crumbles of feta cheese. Mild sausage covered with tomato sauce, sauteed onions, fire roasted peppers and melted mozzarella cheese. Zesty tomato sauce, mozzarella cheese and pepperoni. Grilled chicken, ranch dressing, wing sauce and mozzarella cheese. 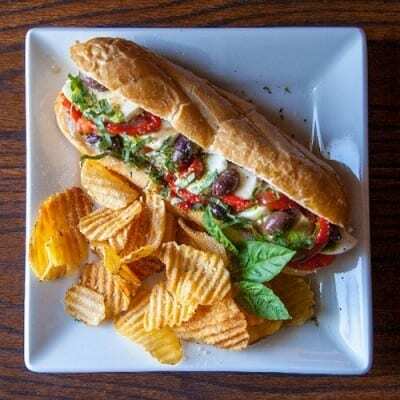 Thin shaved steak, red onions, fire roasted red peppers, feta and mozzarella cheese. Chicken, romaine, shredded Parmesan cheese and Al's creamy Caesar dressing. Crisp romaine, creamy Caesar, garlic croutons and shredded Parmesan cheese. Slices of Hickory smoked turkey breast on top of spring mix, romaine, Roma tomatoes, red onions, green pepper, mushrooms, black olives, banana peppers, shredded carrots, cabbage and mozzarella cheese. Italy's lighter side: ham, Genoa salami, pepperoni served over spring mix and romaine lettuce, Roma tomatoes, red onions, green peppers, mushrooms, black olives, roasted red peppers, shredded carrots, cabbage, mozzarella cheese, and our house olive oil and red wine vinegar dressing. Our Greek salad topped with tender pieces of Al's marinated chicken breast. Spring mix and romaine lettuce, Roma tomatoes, red onions, green pepper, mushrooms, black olives, shredded carrots & cabbage and mozzarella cheese. Feta cheese, pepperoni peppers, imported Kalamata olives served over spring mix and romaine lettuce, Roma tomatoes, red onions, red cabbage and shredded carrots. Served with tangy house-made olive oil and red wine vinegar dressing. A classic that's bursting with flavors both fresh and savory with a refreshing side of spring mix with roasted garlic vinaigrette. Spring mix, romaine lettuce and red cabbage, Roma tomatoes, red onions, green pepper, mushrooms, black olives, shredded carrots, mozzarella and feta cheeses, topped with slices of chicken breast. Marinated chicken with spring mix and romaine lettuce, Roma tomatoes, red onions, green pepper, mushrooms, black olives, shredded carrots & cabbage, plus a combination of mozzarella and feta cheeses. Spring mix and romaine lettuce, Roma tomatoes, red onions, shredded carrots & cabbage, topped with mozzarella cheese. Ham, salami, pepperoni, roasted red peppers, caramelized onions, banana peppers, topped with a swirl of pesto. Fresh spinach, Kalamata olives, roasted red peppers, red onions, fresh basil, feta and mozzarella cheese, over marinara. Crisp bacon, mozzarella cheese baked on thin crust topped with fresh lettuce, tomato, and a little mayo. Healthy choice! Fresh spinach, broccoli, Roma tomatoes, black olives, mushrooms, green peppers, red onions and extra cheese. 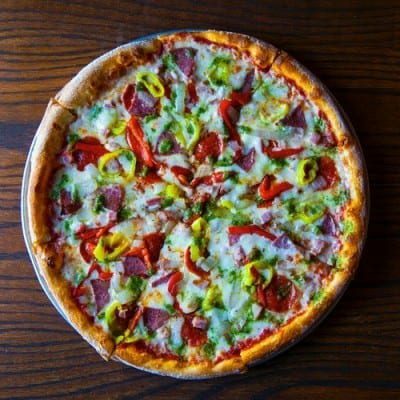 Extra cheese, red onions, fresh mushrooms, green peppers, black olives, broccoli, fresh spinach, pineapple, fresh Roma tomatoes, fresh garlic, fresh basil, banana peppers, jalapeno peppers, pepperoni, beef, sausage, ham, anchovies, meatball or Genoa salami. Bacon, beef, ham, pepperoni, sausage and extra cheese. 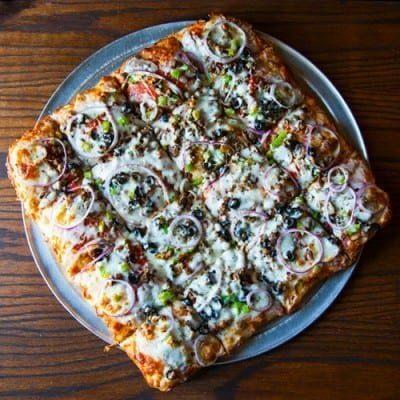 Toppings include: black olives, broccoli, fresh spinach, green peppers, mushrooms, red onions, Roma tomatoes and extra cheese. Toppings include: beef, black olives, green peppers, mushrooms, pepperoni, red onions, sausage and extra cheese. Feta cheese, pesto sauce, chicken, eggplant, sundried tomato, fire roasted red peppers, Kalamata olives, bacon, caramelized onions, artichoke. 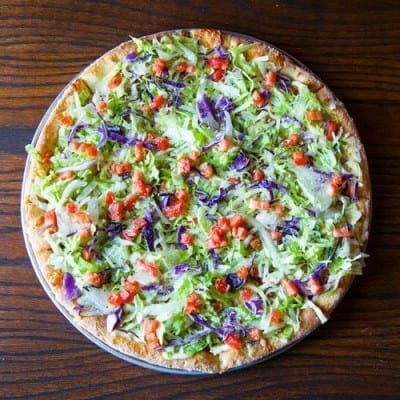 No substitutions on deluxe, veggie or meat pizza. *Sicilian Pizza not available at Neptune Location. Feta cheese, pesto sauce, chicken, eggplant, sundried tomato, fire roasted red peppers, Kalamata olives, bacon, caramelized onions and artichoke. Pepperoni, Italian sausage, beef, ham, crispy bacon and extra cheese. Pepperoni, ground beef, sausage, green peppers, mushrooms, black olives, red onions, and extra cheese. Artichoke hearts, feta cheese, mozzarella cheese, roasted red peppers, Kalamata olives, garlic, and olive oil. 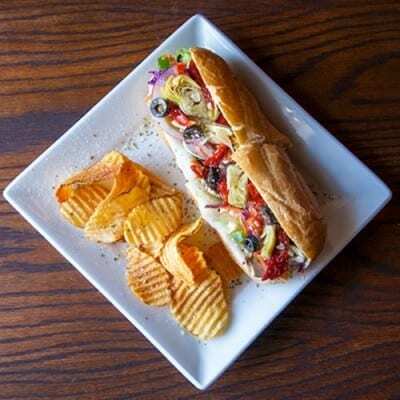 Creamy Alfredo topped with grilled Philly style steak, caramelized onions, roasted red pepper and mozzarella cheese. Crisp bacon, chicken, ham, creamy Alfredo, fresh basil and mozzarella cheese. Juicy ham, and succulent pineapple dress up mozzarella cheese and red sauce. Aloha! Chicken, red onions, fresh basil, mozzarella cheese, and a tangy sweet BBQ sauce! Fresh tomatoes, fresh buffalo mozzarella cheese, basil and drizzled with olive oil. Ranch, medium-spice wing sauce, chicken, mozzarella cheese, and shredded carrots. A creamy peppery sauce, blended with garlic-y, heat-filled Island spices, topped with chicken and mozzarella cheese. Creamy Alfredo sauce, tender chicken, crisp bacon and fresh basil. Mozzarella cheese topped with chicken, and Al's extra-basil-y, pesto sauce. Our nod to Florence: Homemade white sauce, tender chicken, and fresh spinach all topped with diced Roma tomatoes. 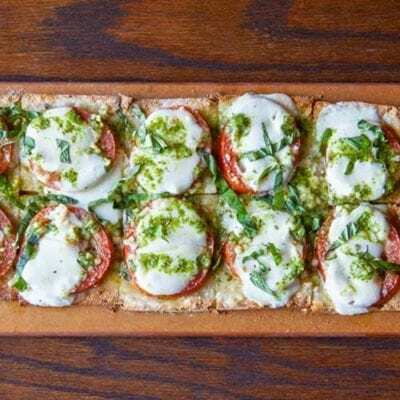 Our homemade white sauce mixed with ricotta, mozzarella, Parmesan cheeses and herbs, topped with fresh Roma tomatoes. Create your own with our pizza toppings. Each filling, .69, specialty, 1.49. Chicken, red onions, barbecue sauce, ricotta cheese, mozzarella cheese and fresh basil. Spinach and feta cheese transform this into a little taste of Greece. Mozzarella cheese, wing sauce, chicken and a side of ranch dressing. 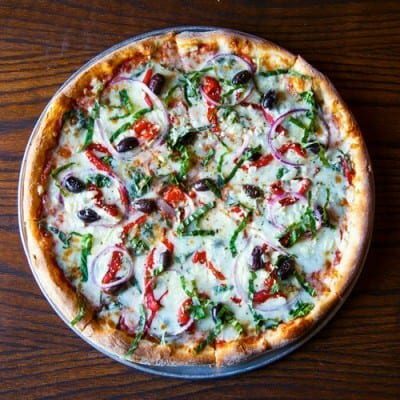 Green peppers, black olives, red onions, broccoli, Roma tomatoes, mushroom and fresh spinach. Meats, cheeses, and loads of veggies too. The flavors of a steak sandwich meet Italy! A truly savory combo. Layers of meat and cheese alternate with fresh tomatoes and slow simmered spices. A rich and creamy homemade Alfredo sauce tossed with grilled chicken, fettuccine, and garnished with fresh grated Romano cheese. Lightly breaded and fried, topped with marinara sauce and melted mozzarella cheese, served with penne pasta. Pasta shells filled with spinach, ricotta, mozzarella, and Romano cheeses, baked then topped, with tomato sauce and melted mozzarella cheese. Crispy, breaded chicken breast topped with marinara sauce and a generous portion of melted mozzarella cheese served with spaghetti. Pasta tubes filled with ricotta and mozzarella cheese, baked then topped, with marina sauce and melted mozzarella cheese. Al's rich marsala sauce with mushrooms, served over chicken breast with penne pasta. 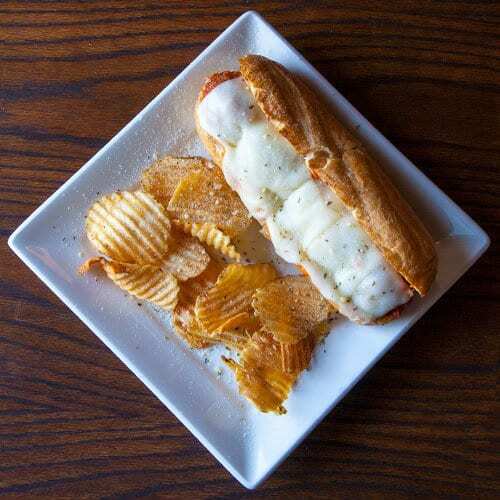 Served with your choice of marinara, garlic butter & parmesan, meatballs, mild Italian sausage, or meatsauce. Fresh mozzarella cheese, Roma tomatoes, roasted red peppers, Kalamata olives, fresh basil, pesto and roasted garlic balsamic dressing. Served with chips made fresh daily. Lettuce, tomatoes, red onions, Olive oil & Vinegar and Mayonnaise available on request. Melted mozzarella cheese, sundried tomatoes, artichoke stopped with lettuce, tomatoes, red onion, shredded carrots & cabbage, green peppers, mushrooms, black olives, feta cheese with olive oil & vinegar. Lettuce, tomatoes, red onions, Olive oil & Vinegar and Mayonnaise available on request. 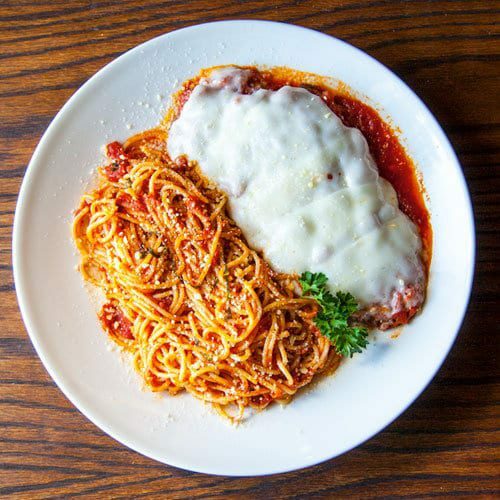 Hand breaded chicken breast sliced and layered with marinara sauce and melted mozzarella cheese. Served with chips made fresh daily. Lettuce, tomato, onion, oil & vinegar with mayonnaise and mustard upon request. Served with chips made fresh daily. Lettuce, tomato and mayonnaise. Served with chips made fresh daily. Served with chips made fresh daily. Juicy shaved steak, grilled red onions and mozzarella cheese all ''wrapped'' up tight. Hickory smoked turkey, provolone cheese, lettuce, tomatoes, fire roasted red peppers, and a roasted garlic balsamic vinaigrette. Ham, provolone, salami, pepperoni, lettuce, tomatoes, red onions and mayo. Perhaps one of Italy's greatest exports. 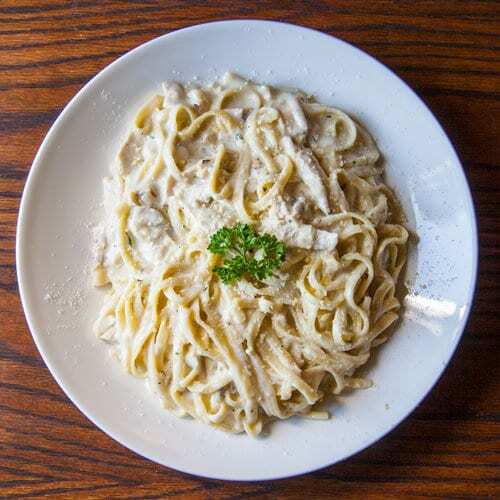 Our version is a rich and creamy homemade Alfredo sauce tossed with chicken, fettuccine, and garnished with fresh grated Romano cheese. Breaded, crisp chicken breast topped with marinara sauce and a generous portion of melted mozzarella cheese. Accompanied with spaghetti. Our dinner portion of lasagna is so big, it's often enough for lunch the next day! 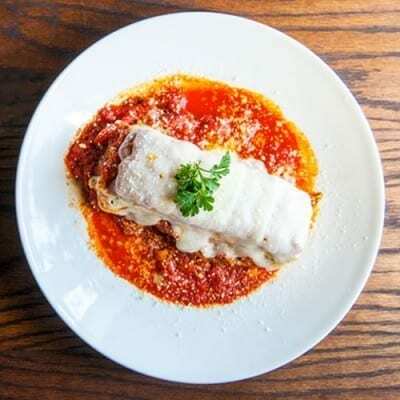 Layers of meat and cheese alternate, creating an unbeatable homemade lasagna bursting with the flavors of fresh tomatoes and slow-simmered spices. Eggplant, lightly breaded and fried, baked with tomato sauce and topped with melted mozzarella cheese. Served with spaghetti. Mild Italian sausage, sauteed bell peppers, fire roasted red peppers, and red onions topped with sauce and mozzarella cheese. Served with penne pasta. Delicate oversized pasta tubes filled to overflowing with ricotta and mozzarella cheeses, baked then topped with marinara sauce and melted mozzarella cheese. 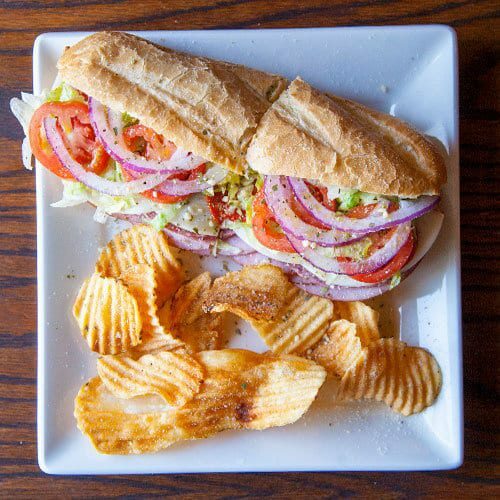 All entrees are served with a house salad and garlic bread. Available all day. Alternating layers of pasta, meat sauce, and cheeses. Served with garlic bread. 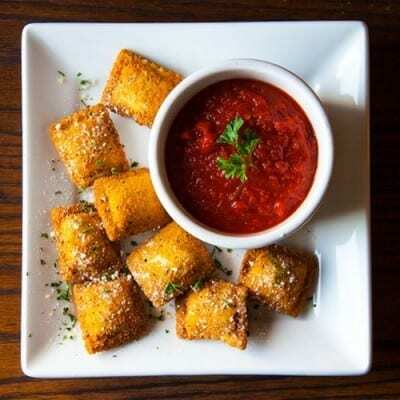 Crispy on the outside, juicy on the inside, served with choice of marinara sauce, ketchup, or ranch dressing. Served simply: Al's marinara or yummy meatballs. Served with garlic bread. A rich, creamy cheesecake in New York's best style. Baked on a crumb crust by The Cheesecake Factory. Finished with raspberry sauce. Hand made to perfection, our cannoli cream is made with fresh whole milk ricotta impastata, mini chocolate morsels, along with a blend of spice and natural flavors. Our most popular dessert, perfect for sharing! Lightly fried dough tossed in powdered sugar. Served with raspberry sauce for dipping.